When I go out to dinner, I want it to be a relaxing and comfortable experience. The type of lights in the restaurant can not be too bright. When the overhead lighting is too bright, it feels like you’re eating at McDonald’s.‎ Now don’t get me wrong, I like McDonald’s as much as the next person. However, I don’t like restaurants that are too bright. You look across the restaurant and you can see what everybody is eating. It’s just not what I call a relaxing “out to dinner” experience. You want some degree of privacy at the dinner table. With bright lights overhead, there is no chance for that to happen. The S14 LED powered string lights are ideal for use in a restaurant, bistro or wherever you want to create a relaxing experience. The S14 LED string lights use a fraction of the energy of standard lighting. That translate to $$ in your pocket. The product will pay for itself in one years time. How many products can you say that about? 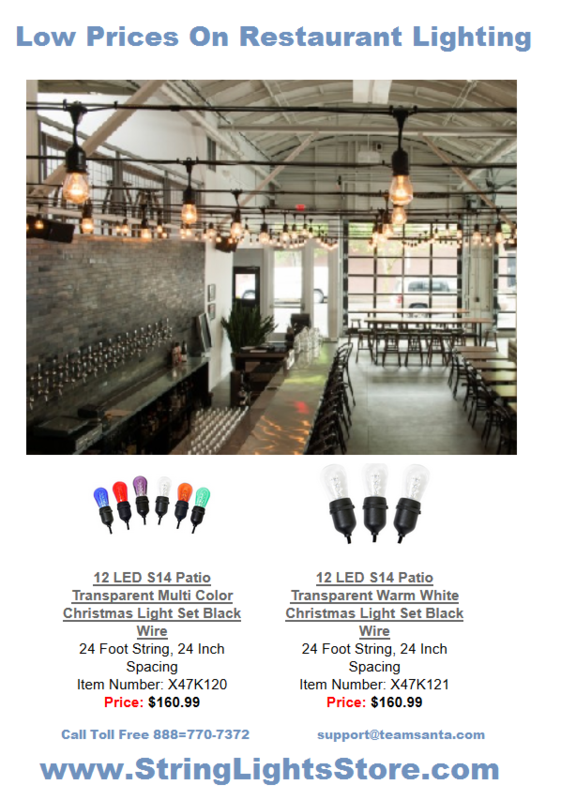 If you own a restaurant, pub, bistro, pub, bar or any other type of social gathering space, S14 LED powered string lights will provide you with a brilliant, yet soft type of lighting that your customer will really enjoy. See ya tomorrow with more cool products to show you.